Beautiful window panel. Very nice price. Adds dazzling color to the room. I love this. 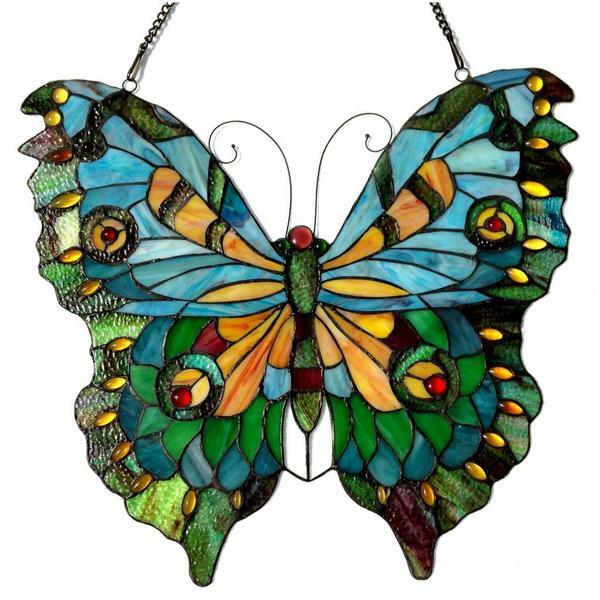 This hand crafted, Tiffany style butterfly window panel/ sun-catcher will brighten up any room! The beautiful blue, orange and aqua color art glass are hand crafted from art glass and mounted on a metal frame. Mounting hardware is included, assembly is required. Main Colors: Beautiful tones of Blue, Orange, and Aqua art glass. Includes attached hooks and chain for easy installation. Dimensions: 21 inches high x 20 inches wide. Arrived in excellent condition and quickly. Have hung it from one of the glass panels of our master bath shower enclosure. Light shinse through it beautifully. Colors around the edges are much darker than shown in the picture and it has more darker browns and greens than I expected, but still very pretty. Word to the wise ---it arrived very diry. It took me over an hour to wash each of the pieces of cut-glass (front and back). It was worth the time... colors are now much richer. Beautiful butterfly in hand cut pieces of stained glass. Colors include Blues, Aqua, Red, Oranges, Greens, Black, Possibly Yellow and Others! Although it is 20"W at some point, it would not fit my clients window that is exactly 20"W. Seems to be the way the piece is made.. like a real butterfly the sides aren't straight. Prob would fit a 21"W window better. Client loved it and really didn't want to do a return but had no choice. Overstock handled everything efficiently... very understanding. beautiful stained glass butterfly, bought for granddaughter....love it! The butterfly stained glass is nice but i received a wrong color. Overstock has been so helpful for returning the item and exchange it. But when item arrived the 2nd time it was very similar from the 1st one I received. The edge around were clearer and lighter in color &amp; not dark green like in the picture. The color was not the same in person. The one in picture is nicer and color were vibrant &amp; alive not unlike in person. I did not return it again, I just keep it. It was pretty though but not as pretty as in the posted picture. Thank you Overstock. Love, love this beautiful Chloe Tiffany Style Butterfly Design Window Panel. It's large and the colors are so very pretty. I can't wait to hang it. It will hang in my sunroom where it will be absolutely amazing. Thank you!!! i use as curtain in my bathroom and when the sun the butterfly color show on the wall. Love it!! I love this Tiffany style butterfly, it’s so pretty. I bought this for my wife.She loves stainded glass and butterflies so i couldn't go wrong with this georgeos piece.very beautiful and made my wife very happy. This is exactly as beautiful as pictured. When the sunshines through the window or even just daylight, it sparkles magnificently. It is truly gorgeous. It was packed very well and arrived undamaged. I felt it was a great bargain for the price charged by Overstock.com. I love it. Great gift. She loves it. This is beautiful! If you have a large window or sunny spot, that you want to jazz up a bit...get this. Well made and packaged well. This was a gift but almost kept it for myself..So now I am going to get to get one for me..Can't go wrong. Beautiful colors. Have added this piece to the many pieces I bought at Overstock.com. Quite big with a bold look. Have this piece hanging on my porch. The colors are not nearly as vibrant as the photo, so I was slightly disappointed by that, but I still like the piece. It is thin and delicate, not heavy. Little bigger than I thought. Have to have a large window to display but absolutely gorgeous. "Is this real stained glass"
"Can this panel be hung outside - will it take weather?" Hello hmwalsh, this item is recommended for indoor decoration. Please feel free to contact us again with any further questions. Thank you for shopping with us! "Can I buy the mounting hardware alone?" Hello sluggo, unfortunately no. We apologize for any inconvenience we might have caused. Have a great day! It is gorgeous and exactly fits a small window I want decorated. Overstock is a blessing. I always find the coolest stuff for our home here. This Butterfly will add color to any window it hangs in. Right now it will hang in a Sunroom and reflect into my Den. The colors are Beautiful. I love butterflies and stained glass. This looks beautiful. It's a beautiful piece that will look stunning in my daughters house, and my granddaughter will love it too. I have two others, that are different , that I bought about 15 years ago , prominently hanging in a sunroom, and have space for one more , and like these colors and design. They give me a lot of peace and pleasure...….